The Indian Army is miffed by delays in Rs 1,000-crore equipment proposal to buy urgently required equipment for its nine Para-Special Forces (Para-SF) battalions from the US. Disagreements within the ministry saw the proposals to acquire new assault rifles, night vision devices and machine guns being dropped from the agenda of a March 20 meeting of the Defence Acquisition Committee. Top Ministry of Defence (MoD) officials want the equipment to be purchased through the Foreign Military Sales (FMS) route from the US, to be broken up into smaller procurement of Rs 300 crores and acquired by the Army under its own financial powers. This process, sources say, could further delay acquisitions by another six months. 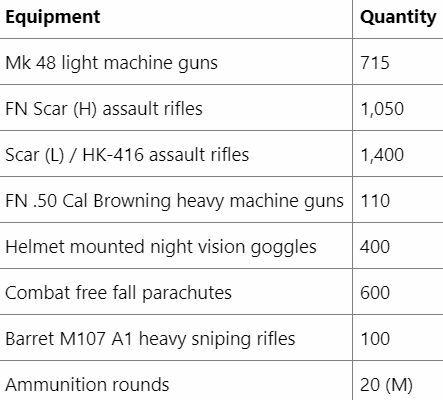 The shopping list includes 715 Mk 48 Light Machine Guns (LMGs), 1,050 FN Scar (H) 7.62x51 assault rifles, 1,400 FN Scar (L) or HK-416 assault rifles, 110 .50 Cal Browning heavy machine guns (HMG), 400 helmet-mounted night vision systems, 600 combat free fall parachutes, 100 Barret M107 A1 heavy sniping rifles and 20 million rounds of ammunition for all of these small arms. The proposals are part of fast-tracking of Para-SF buys initiated after September 29, 2016, cross-border raids on terrorist launch pads in Pakistan-occupied Kashmir (PoK). It is the most comprehensive re-equipping of the Para-SF in over two decades. Indian Army’s SF units drew the list based on evaluations done after joint exercises with the US Special Operations Command (SOCOM). Each acquisition fulfils a critical void. The .50/ 12.7 mm HMGs are meant to be fitted on the Light Strike Vehicle (LSVs) being procured from Pune-based Force Motors over the next three months. The 7.62 x 51 mm FN Scar, made by a US unit of Belgium’s FN Herstal, is required to upgrade the firepower of SF operators in dense jungles of the Northeast and Myanmar. The case for a new lightweight belt-fed 7.62 x 51 machine gun to replace 50-year old OFBmade ‘1B’ LMGs, has been pending since 2005. The LMGs are critical squad support weapons giving the small six-unit teams of the Para-SF units heavy firepower. In their absence, SF units resorted to stripping machine guns from de-commissioned battle tanks or using weapons recovered from militants. This procurement is part of a larger upgrade which includes Finnish Sako sniper rifles, Carl Gustaf Mark-4 rocket launchers and Beretta pistols and LSVs. The last major acquisitions for the Para-SF a decade ago were also FMS procurement from the US.